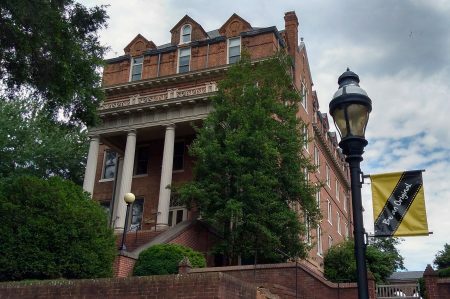 Randolph College’s Moore Hall Lounge will be converted to an environmental science lab this summer. The renovation will be funded by the Virginia Foundation for Independent Colleges (VFIC). The $9,616 grant from the VFIC will allow the College to install new flooring, a larger sink for washing field equipment, countertops and cabinets, a storage area for ongoing projects, and IT equipment. In addition, Adam Eller ’13, an environmental program alumnus, made and will contribute a hydrology table. Staying true to the College’s liberal arts tradition, a wall will also be reserved to display student artwork. The renovation is expected to be completed before the start of the fall semester. As an alumna of the program, Sara Woodward ’16, who is now Randolph’s sustainability coordinator, is also excited about the possibilities the new space will provide. In addition to the lab, the VFIC is also funding an environmental-themed Summer Research project by Tyrah Cobb-Davis ’19 and an experiential learning scholarship for Molleigh Tomlin ’18, who is interning for Centra Health. Josie Hatley ’18 also received funding for her internship for the Public Health and Human Services Division of the Eastern Band of the Cherokee Nation.